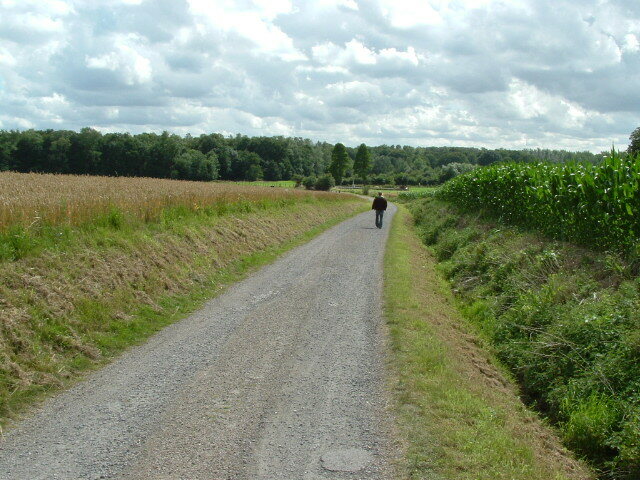 The road to Ploegsteert Wood. 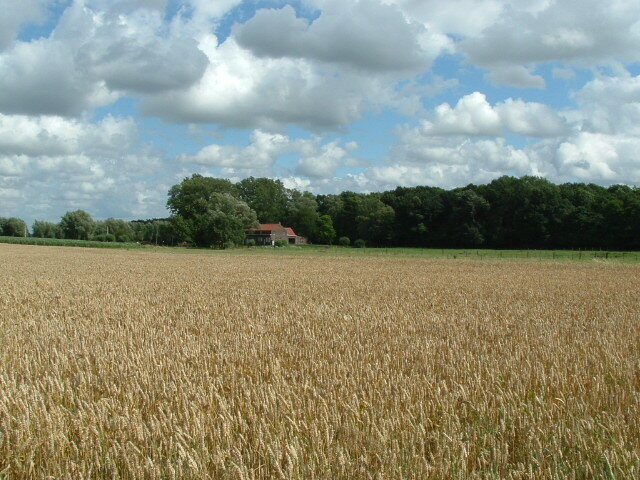 Looking south east across the cornfield to our left towards the north eastern corner of Ploegsteert Wood; the farm house in the centre is close to the site of a British strongpoint known as Moated Farm. Looking back up the ridge at Prowse Point Military Cemetery. Mud Corner Cemetery has only 85 burials, all being Australians and New Zealanders (despite what you may read elsewhere) and all except one being killed in June, July or August 1917. The cemetery was begun on 7th June 1917, the first day of the Battle of Messines, and many of the soldiers in Plot I Row A were killed on that date. Mud Corner lives up to its name to this day, hence the little bridge we have to cross to gain access. 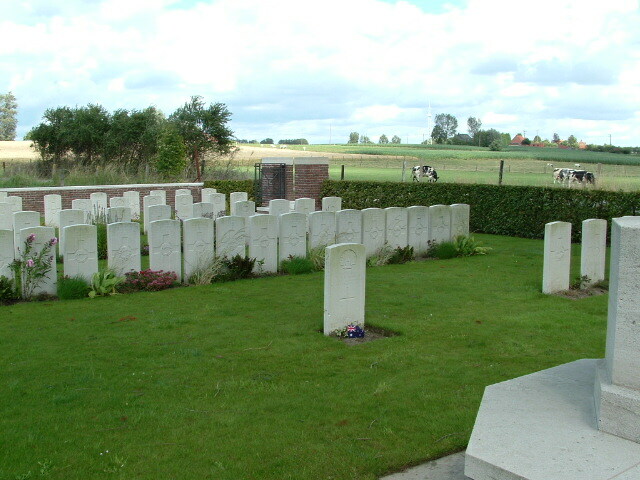 The three headstones in the previous picture are out of shot to the right; in the foreground is the only other headstone in Plot II Row E, in fact the final burial in the cemetery, that of Private A. H. V. French of the Australian Pioneers. 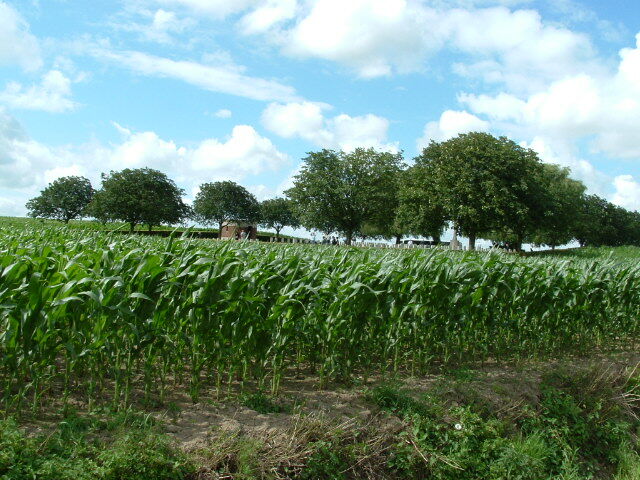 Behind is Plot II, while Plot I can be seen in the left background. 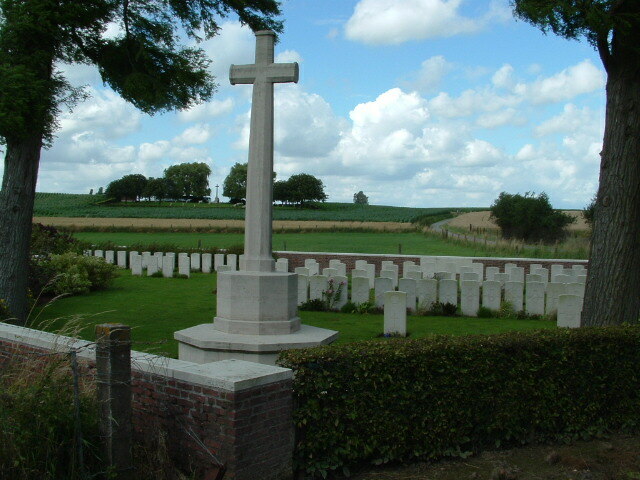 In the distance, Prowse Point Cemetery sits in its perfect position on the crest of the ridge. Plot II, this time looking north east towards the cemetery entrance. 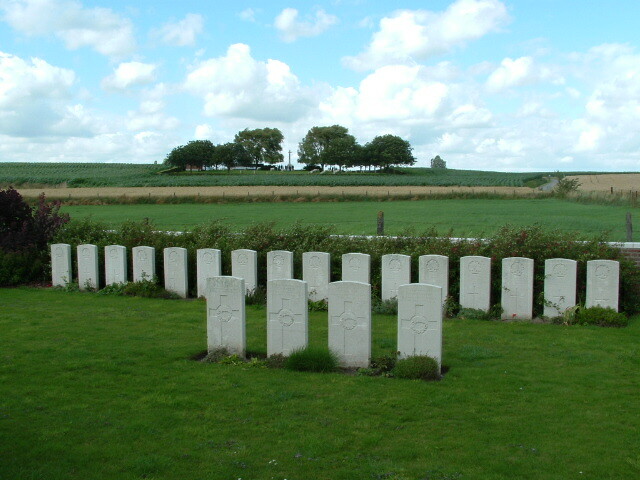 Private French’s headstone is in the centre foreground, and the headstones of Privates Fleming and Cartwright are visible to the far right. Mud Corner Cemetery, with the brooding mass of Ploegsteert Wood beyond. That’s my Belgian chauffeur Baldrick, by the way. As opposed to in the way. More of him later. While we’re walking, you will have noticed that I’ve found a way to use the expression “brooding mass”. Given that whoever first came up with “brooding mass” deserves all due respect (don’t you think? ), I’d say that’s another ambition achieved. You don’t care, do you? Thought not. Thank you for showing how it isn’t all wet mud, dry statistics, 2D maps and bits of rusty barbed wire. Wandering round these beautiful places with you on your virtual tours brings life, joy and humanity to the geography and history of this landscape. Who would have thought the graves and memorials of the War dead could bring such an enjoyable and absorbing perspective to this land. I look forward to the next installment. Lee, three photos from the end, back row, sixth headstone from the right. That’s your Great Uncle Alexander’s grave and headstone. His grave number is Plot I Row A 11. 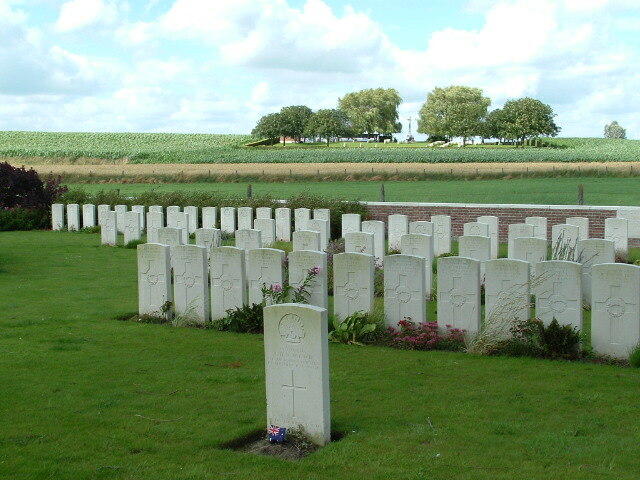 All the men buried in that row were killed between 7th & 10th June 1917. 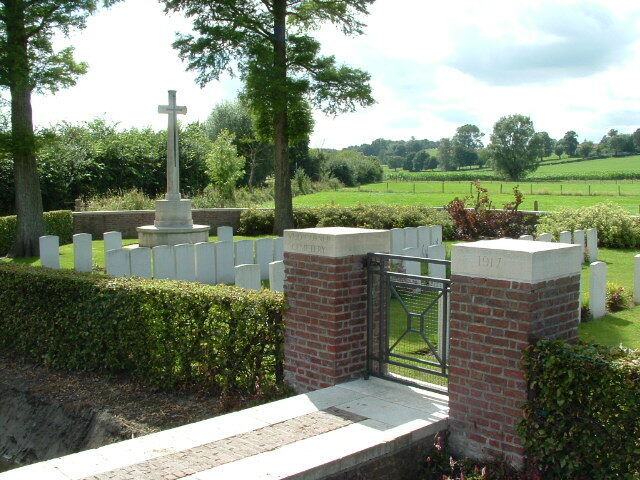 There’s a lot of stuff elsewhere on this site about the Battle of Messines (he was killed on the first day of the battle), and many more graves of men killed on that first day. Surname which is McIlroy.He wrote McElory on his inlistment paper’s. Thanks David. You might consider informing the CWGC, as their website currently says, “Son of Hugh and Susan McElroy, of Christchurch, New Zealand.”, which is clearly wrong. They’d probably appreciate it. about his parent’s name but no word yet. So i have some more info about the McElroy’s. it appears that his parents (Hugh and Susan) changed their surname to McElroy at some time before their son’s enlistment into the army in 1917 as a McElroy.It seems to me that there is no other evidence you could produce from New Zealand sources that would convince the CWGC to change its records, if that is your aim. Birth Certificate showing he was born a McIlroy. Good job David. Well done on that. I believe Gabriel McElroy is also my grandmothers uncle. Is your grandmother Susan..
on 7th June 1917 at Messines? Is there at list of names anywhere? no he is not at Mud Corner, But i found him here . Thanks for that. Would that mean then that his final resting place is not known or he was never recovered for actual burial? Believed to be buried in this Cemetery or Known to be buried in this Cemetery. Tom, David is correct, to a point, but do not forget that the thousands of unknown soldiers who are buried in the cemeteries of Flanders and are remembered on the Menin Gate (and elsewhere), are all listed in effect as ‘missing’, there are no names on their headstones, and there is every possibility that one of them is your second cousin. Sadly, we will never know. Yes, that’s a good point, thank you. Photos of the Menin Gate here: http://thebignote.com/2011/02/07/ypres-ieper-%E2%80%93-the-menin-gate/ but a much more detailed look at the Menin Gate will be coming to a BigNote website near you in the not-too-distant. Thankyou. 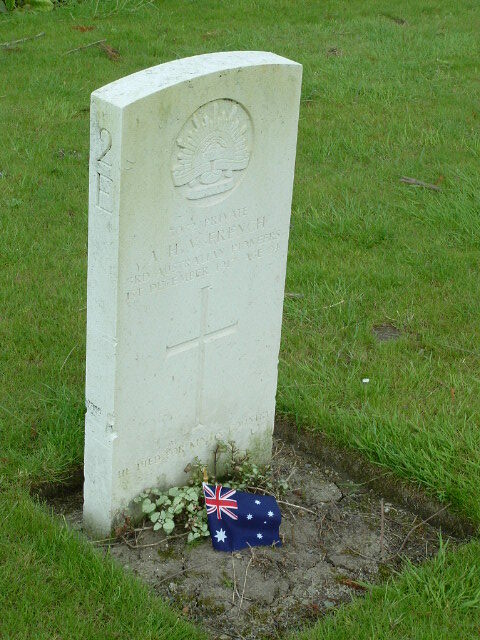 I believe that my uncle a soldier with the New Zealand Army is also buried here. Neil Grant was his name. yes he is buried at Mud Corner see link. (Final) click on it and find Grant Sgt.A.N but on his grave stone he is Corporal? I just found out recently that one of my great uncles was buried here, I was wondering can you go to individual headstones to view. His name was W. Morrow 28284 killed 23.7.1917. 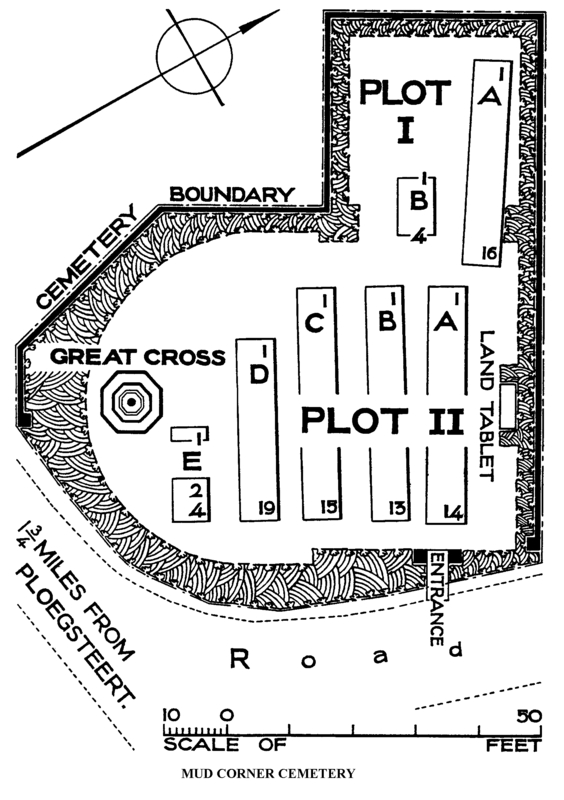 Grave 1B3. His headstone is in the third photograph from the end, as you doubtless noticed. Yes Ann, you can visit any time you like, but if you do, take your boots! You don’t call a place Mud Corner without a reason! Hello David. 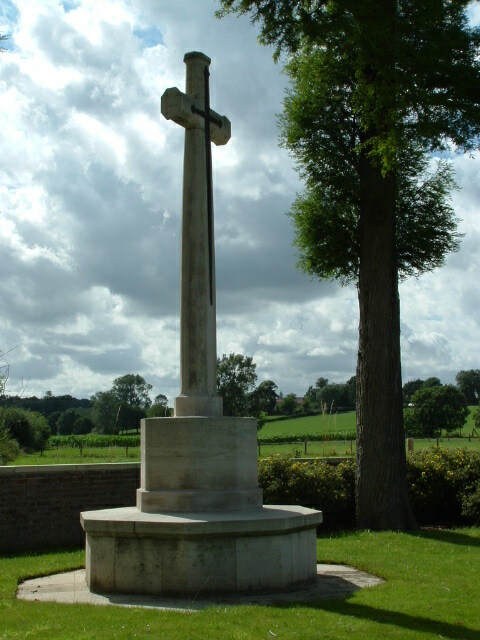 No, the CWGC won’t be changing their records. McElroy he will remain. My grandfather Edward Beach died on 26th July 1917 at the Battle of Messines. Is there any chance I can see a close-up of his grave and also an idea where in the cemetery he is located. He was actually 54 years old when he died and my mother was only 8 years old at the time. Edward said he was 40 simply to get into the war effort and he never came back. email i can send it to you..
Is there any chance I can see a shot of where my grandfather’s grave is in Mud Corner. His name was Edward Beach and he died on 26th July 1917. I would also like to see a close-up of the grave if possible. Living in New Zealand, it is not likely I will ever get over there to see the grave myself. My mother was only eight years old when he was killed. Robin, your Grandfather’s headstone is visible (partly) in photograph eight in this post. 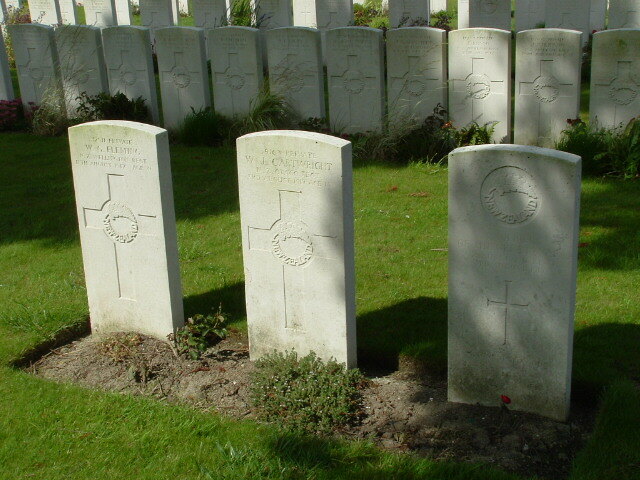 His headstone is the sixth from the left of the third row if you take the single headstone in the foreground as the first row. I should get in touch with David (who knows his stuff when it comes to Mud Corner) to get a close up as I’m afraid I don’t have one. 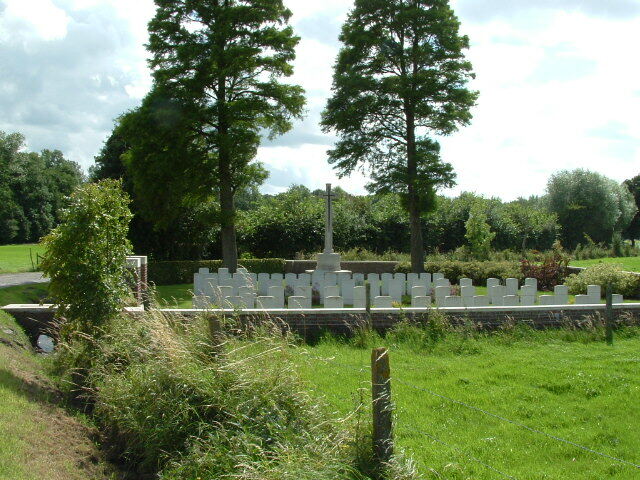 My husband’s great uncle (Alfred Hester) is buried at Mud Corner and we would like to visit his grave as we are travelling to Europe later this year. Can you advise the best way to get from Brussels to Ypres and then Ypres to Mud Corner. Hello. I’m no expert on public transport in Belgium, I’m afraid. After all, I don’t need to be. I have a chauffeur! Seriously, I imagine there’s a train from Brussels to Ieper, and for what it’s worth it takes about 15 minutes to drive from Ieper to Ploegsteert. Maybe there’s a bus. Or train. I’m sure you’ll find a way and I’m sure you’ll have a great trip. And remember that Mud Corner often lives up to its name.